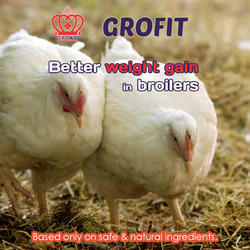 Crown Grofit is a unique blend of carefully selected medicinal herbs for better weight-gain in broilers. Since the ingredients used are natural herbs, no adverse effects are likely to occur. Available as powder and liquid concentrate. Looking for Poultry Feed Additives- Broilers ?